I can’t help screaming “Wheee” as my body, harnessed to a steel cable, flies through the air for an astounding half mile. 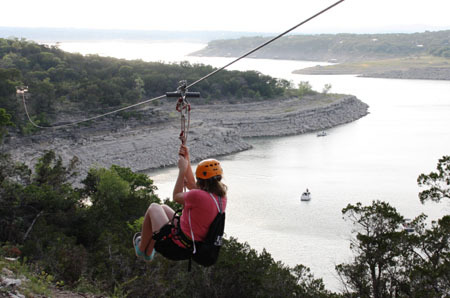 Whoops and hollers are expected when soaring the final zip line at Lake Travis Zipline Adventure near Austin. Whizzing over incredible canyons and lake inlets is hard to beat for a pure adrenaline rush. 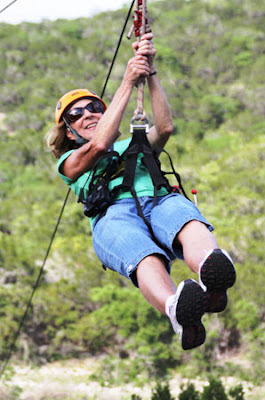 Larry and I recently nurtured our inner thrill-seekers on a day excursion to Lake Travis Zipline in central Texas. It promises plenty of action for all ages making it a perfect family adventure. After all, when was the last time your teen wanted to do an activity with you? Members of our group were outfitted in harnesses with all sorts of hooks and cables, the uniform of zipping. Our delightful guides made sure everything fit securely and explained how the automatic braking system works. Rather than needing to wear a glove for protection when manually stopping motion on the cable, the automatic system leaves your hands free for waving to friends. Do remember to hold the cable away from your face when it hits the brake box, though. After arriving and checking in, a boat ride takes guests across the river from Volente to the zips. Five lines range from 250 feet to over 2000 feet--the longest and fastest zip line in Texas. Early lines are shorter and work up to the grand finale where you’re launched off a 20-story high cliff and swoop across Lake Travis for almost half a mile, possibly achieving speeds up to 45 miles an hour. Participants should be in reasonably good condition, since you have to walk uphill on trails to the zip platforms, but trained guides lead the way and provide guidance on these nature walks. Throughout the adventure we were offered snacks and cool bottled water, necessary in Texas summers. While waiting for others to take each plunge, you’ll enjoy amazing views of lake and hill country. Tours run 2.5 to 3 hours long. If you want to extend the day, you’ll have access to a private beach where you can swim in the lake or relax in lounge chairs. Picnic tables under shade trees are also available, and the boat driver will deliver your cooler and picnic basket. If you’re truly adventurous, try the moonlight excursion, scheduled only during the full moon each month. Bring your own adult beverages and see lights sparkling on the lake as you zip seven times. I look forward to trying the night time zip. Participants should weigh between 70 and 250 pounds. Wear closed toe shoes and bring sunscreen. Look for coupons or special rates on social buying sites--then go have a blast!